Today's class was led by Chris, and it was a neat case focusing on a Dairy Farm. We ended the class early to give the students time to break out into their final project groups, and have the opportunity to ask us questions regarding their projects. Their assignment is to pitch us a business idea, through the form of a one page summary and a ten minute presentation on the last day of class. Some of the ideas were really well thought through, and others we pushed a bit, to encourage them to dig deeper. Lots of enthusiasm though, so I'm excited to see their final products next week! Prof. Haggerty and her niece, Kaila, arrived this afternoon, and we spent some time catching up with them. It is now a full house, and my room has been transformed into a camp-style room with the three beds and very little walking space in between. We're excited to have them here with us, and to share with them our exciting adventures at SFB! After lunch, we made our way to the large auditorium, for the swearing-in ceremony of the 2013-2014 SFB Students' Union. We received a formal invitation yesterday from one of our students, complete with a program and detailed schedule of events. In true "pole pole" fashion, the ceremony started two hours late, so the boys went home to nap, while I waited around with Rehema, one of our faculty friends. Chris joined us soon after the ceremonies started, and I am so glad we were there to support! Many of our students from the class were at the front, as outgoing members of the Students' Union. They were thrilled to see us there, and made us feel very welcome, seating us in the distinguished guests section. The entire ceremony was extremely formal, with each incoming member holding the Rwandan flag with their left hand and raising their right hand high while reciting the oath. The Rector of the University acknowledged Chris and I in his speech, and was so kind with his words, thanking us for our contribution to the students' learning, for our enthusiasm in our endeavours, and for promoting sound decision making in business. I was a bit taken aback when I heard the phrase "we love you" at the end of his blurb to us; it was incredibly touching! 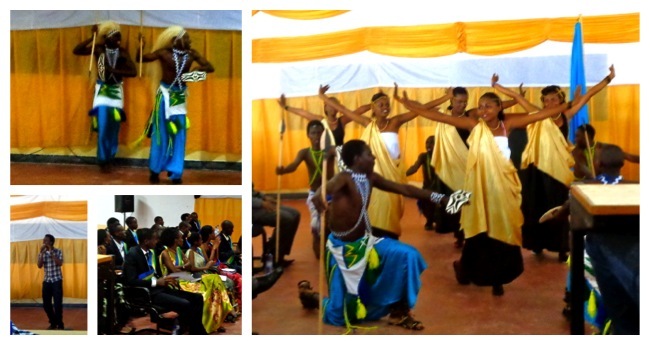 Interspersed between the swearing-in and various presentations, the four hour ceremony featured three singers and two cultural dance troupes, all of whom were amazing. Apparently a couple of SFB students are extremely famous pop stars, attending classes when they're not away touring East Africa! We were fortunate to have two such stars perform at the ceremony, and we were super impressed! The first pop star was extremely engaging, and in his second song, he came into the audience and held out his hand to me. I was my awkward self and just shook his hand from my seat, but the next time he came around with his hand outstretched, Chris and Rehema pushed me into the aisle and he twirled me around before I was able to sit down again. Rehema told me that he was singing a very popular lovesong, so I turned cherry tomato red, something that does not normally happen for people of my colour! It was pretty hilarious, and our students were raving about this little serenading incident at the cocktail party afterwards… How embarrassing!